(Wired News) China Cracks Down on Net Games. June 5, 2004. Ministry of Culture officials said all online and wireless games produced outside the country will now be subject to examination first before they can be legally distributed within the country. Foreign producers of online games already in distribution must submit those products to MOC examinations by Sept. 1, or face punishment. "The ministry allows the import of foreign online games whose content accords with Chinese national conditions and has positive effects on young people's mentality," according to an MOC statement. Two European games were recently banned. One, Hearts of Iron by the Stockholm-based Paradox Entertainment, fell afoul of censors for "distorting history and damaging China's sovereignty and territorial integrity," according to China's Ministry of Culture. Within the game, territories labeled on a map as "Manchuria," "West Xinjiang" and "Tibet" are sovereign nations, and Taiwan is portrayed as a Japanese territory. "All these severely distort historical facts and violate China's gaming and Internet service regulations, (and) the game should be immediately prohibited," said a Ministry of Culture spokesman. (Reuters via MSNBC) China bans game that recognizes Taiwan. December 7, 2004. China, sensitive about issues of national sovereignty, has banned a computer sports game that classifies Taiwan, Hong Kong, Macau and Tibet as countries and has threatened to fine Web sites that supply the game and Internet cafes that let patrons download it. The game, "Soccer Manager 2005", contained content that harmed China's sovereignty and territorial integrity and violated Chinese law, the Xinhua news agency reported on Tuesday. Any Web site that offered downloads of the game would be fined up to 10,000 yuan ($1,210), Xinhua said, quoting an order from the Ministry of Culture. Cybercafes that failed to prevent players from downloading, installing or playing the game would be fined as much as 15,000 yuan, it added. Taiwan, Hong Kong and Macau were listed as independent countries in the game, and the Himalayan region of Tibet, which Chinese troops occupied in 1950, is called "Chinese Tibet," which elevated it to the same level as China itself, Xinhua said. (Australia Tibet Council) FIFA Apologizes To China Over Tibet Reference. December 10, 2003. FIFA has apologized to China for listing Tibet as a “neighbouring country” of China rather than part of the People’s Republic of China on an official website of the FIFA World Cup 2006 launched last week (3 December). FIFA, the international governing body of soccer, confirmed today that it had apologized to Beijing after receiving complaints from the Chinese Football Association and people in China. (AP) Textbooks headed for a Japanese school in China were seized by customs officials who objected to the way maps in the books depicted the Chinese mainland and rival Taiwan, an official said Tuesday. The maps showed the mainland and the island in different colors, said Foreign Ministry spokesman Liu Jianchao, indicating that Beijing was concerned this might make Taiwan seem like a separate country. "The Japanese textbooks showed China and Taiwan in different colors," Liu said at a regular news briefing. "The 'one-China principle' is paramount, so it is legitimate for China's customs to handle this according to the law." Time magazine gave the full treatment to China with the subject title of China's New Revolution (complete with Chairman Mao in a LV suit on the front cover; see CSR Asia). 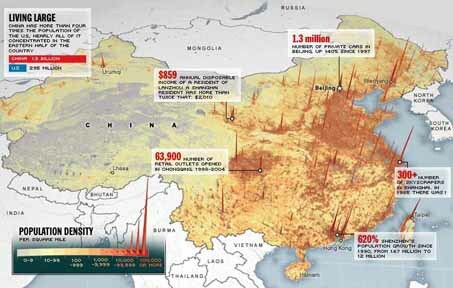 Among the CSR Asia links is this link to a "fabulous graphic showing population density across the country." For its efforts, Time got lambasted by Taiwan's Minister of the Government Information Office (GIO) Pasuya Yao (姚文智). According to Ming Pao (via 6Park), on account of the fact that this map showed Taiwan with the same yellow/brown earth colors for China as opposed to the white for all neighboring countries, Yao has asked the foreign ministry's overseas offices to write Time magazine's New York City Headquarters as well as their Hong Kong office for a correction. Yao said that if Time magazine wants to discuss mainland China, it ought to recognize the independent sovereignty of Taiwan because "Taiwan is not a part of China." How appalling can this get? 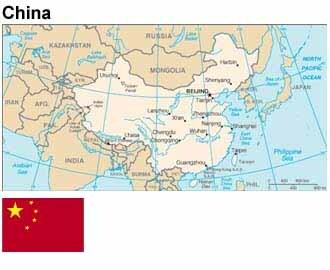 This map shows the title 'China' and it displays the five-star flag of the Commie bandits. It also displays Taiwan in the same color as mainland China and different from the neighboring countries. Yet, I can say with 100% certainty that Pasuya Yao won't dare to whisper a squeak of a complaint. Why? The web site belongs to the United States Department of State. So much for all that talk about independent national sovereignty. If the Taiwan Foreign Ministry does write to the US Department of State, it will probably receive a curt reminder of the Shanghai Communiqué: "12. The US side declared: The United States acknowledges that all Chinese on either side of the Taiwan Strait maintain there is but one China and that Taiwan is a part of China. The United States Government does not challenge that position. It reaffirms its interest in a peaceful settlement of the Taiwan question by the Chinese themselves." Conversely, from the viewpoint of Time or any other company, who would you rather offend? China or Taiwan? Pasuya Yao should not be expecting a correction from Time anytime soon.